This quote on the top of Dead Frog Brewing's Commander Imperial Stout (2016) bottle is perfect, and a reason why I'm finally going out and reviewing beers I've been meaning to review years ago.. rather than have them sit in my fridge. That being said, I've never been a fan of Dead Frog, and I've been reluctant to review their beers here ever since I first reviewed their Nut Brown Ale back in 2012. Well, times have changed and they use standard brown bottles (including 650mL bomber seen here) now days rather than their custom embossed clear glass bottles. So now it's time to try the beer instead of leaving it in my hoard for much longer! 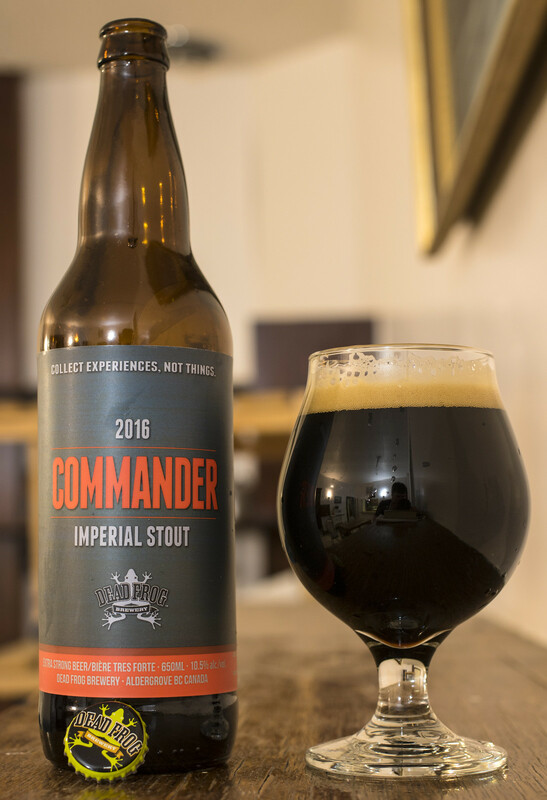 This bottle of Commander Imperial Stout from 2016 is described as: "a rich & complex Imperial Stout aged on maple whisky soaked white oak. This dark roastd stout features a deep, layered malt profile enhanced by slightly sweet flavours of white oak, maple, and whisky. All these flavours combine to create an elaborate Imperial Stout. Suitable for enjoying today and made for cellaring to be enjoyed down the road." Appearance: Like many of the other stouts I've been reviewing lately, this pours just like all the others - this pours a thick, black stout with a moderate amount of burnt caramel head on top that quickly changes to a yellowish-beige head over time. As I let the beer warm up, it leaves behind just a smidge of foam around the side of the glassware. Aroma: My first impression of the aroma is a woody, mild white oak aroma with a hint of vanilla, an ever so faint sweet presence of maple syrup.. and even more woodiness. Not really noticing any Whisk(e)y notes at all - not much of a booziness at all. There's a faint aroma of coffee and a light amount of milk chocolate popping up. So far, this is lighter than expected.. I was really looking forward to the maple aspect of the beer. However, that sweetness you see here is maple.. but it's not noticeable if you're coming off a bad cold/flu. Overall Thoughts: I think I only paid $7~ for this back in 2012 so it definitely cheaper than most Imperial Stouts, but I'm surprised this is 10.5% ABV as it's lacking in some of the rich coffee notes and the barrel aging that I was expecting in this beer. It's very smooth, decently sweet, and I feel like this will get me tipsy before I know it because it doesn't taste anywhere as boozey as most Imperial Stouts I've had in the past while. I think it's time for me to review more Dead Frog products in the future.